Chimney Rock was once home to an Ancestral Puebloan Indian Village overlooking the Piedra River. 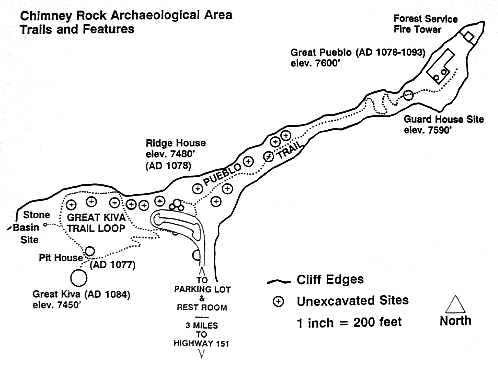 With excavation beginning in the 1920's, the archaeological site now covers 3,160 acres of the San Juan National Forest, (17 miles west of Pagosa Springs and is home to hundreds of excavated archaeological sites. 91 of these sites may have been prominent living structures of the ancient people. Chimney Rock is open from May 15 - September 30. During these months, the visitor center is open from 9 AM - 4:30 PM daily. 2 trails lead up to excavated and undisturbed sites. Tours are offered on these trails and is 2.5 hours long. 16 individual sites are scattered on top of the high mesa. 4 of these sites have been stabilized and are visited on the tour. The Grand Kiva was a site that was possibly used not only in ceremonies, but also in secular activities such as town meetings. The Pit House site and the Ridge House site were both probably residential buildings. The Great House is thought to be part of the Chacoan culture, as it is constructed differently than the Mesa Verde buildings. This makes it the farthest northeastern Chacoan cultural boundary. 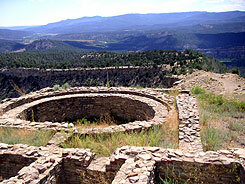 The Great House had its own kivas as well as other rooms for living. On the tour, you can learn more about these fascinating areas. The last stop of the tour is the Fire Tower. From here, you will see a panoramic view of the entire park. There are other programs that take place at the park, some of which include full moon programs and sunrise programs during the summer solstice and the autumn equinox. An educational program about Puebloan dances and "Life at Castle Rock: Festival of Crafts and Culture" are also offered. Other workshops are offered during the summer, too. Every 18.6 years, the "Northern Lunar Standstill" takes place. At Chimney Rock, the moon appears to rise between Chimney Rock and Companion Rock when viewed from the upper mesa near the Great House. The cycle lasts 30 months. The last cycle was in 2004, and the next cycle will begin in December 2022. 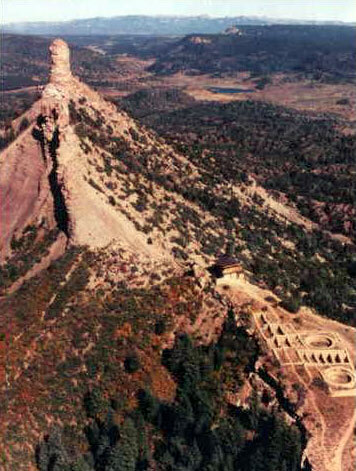 Also nearby is Mesa Verde National Park. Located about 43 miles from Durango and 17 miles from Pagosa Springs, Colorado. Take U.S. highway 160 east from Durango or west from Pagosa Springs to Colorado highway 151 and turn south. The entrance is 3 miles further, on the right.